Smoke billows from piles of smoldering cow dung at a cattle camp outside the town of Mingkaman, South Sudan. Children covered in ash dump grain bags full of fresh manure on to the ground, beside their makeshift homes. Once dried by the sun, they throw it on to the burning dung heaps. This keeps mosquitos from biting and infecting the nearly 3,000 head of cattle, a source of livelihood for dozens of families living in the cattle camp. Mamour Ayii is a 30-year-old Dinka cattle keeper who grew up in the camp near Mingkaman. He remembers a time, not so long ago, when the fields surrounding the camp were pastures for grazing. Now this area is known as “Site One,” home to hundreds of displaced South Sudanese families. With an assault rifle slung over his left shoulder, Ayii said he tunes in regularly to Mingkaman 100 FM on his mobile phone due to the fact that nobody living at the camp owns a radio set. 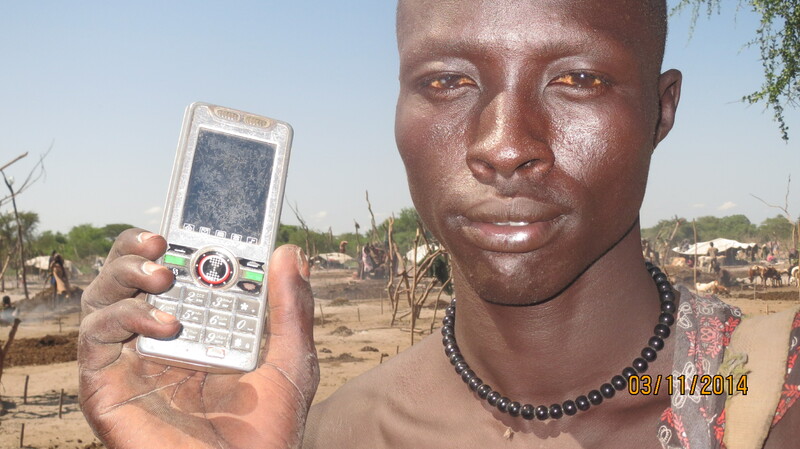 “The reception out here on my phone isn’t too good, being so far from town, but if I use my headphones I can hear it better,” he said in Dinka. Mingkaman 100 FM was set-up by Internews earlier this year to help humanitarian organizations provide critical information to over 100,000 people displaced by the fighting in neighboring Jonglei state, across the Nile River from Lakes state. Residents of Bor, the capital of Jonglei, fled to Mingkaman, creating a need for a humanitarian radio service. Radio plays a vital role in South Sudan, providing an information lifeline to many families, especially those leaving everything behind. At Mingkaman 100 FM, five of its reporters are also displaced with their families from Jonglei, while another three come from Awerial County in Lakes state. This dynamic makes the radio station unique in its approach to the needs of everyone in the community. The radio station’s manager, Aguer Atem, said due to recent clashes at cattle camps outside of town, he’s had to ask his reporters to focus on stories that promote peace between internally displaced people, known as IDPs, and long-time residents of Mingkaman, known as the host community. Lakes state is prone to violent cattle raids. Last month, a conflict erupted when a displaced cattle herder returning home to Bor from Mingkaman led his unvaccinated cows through the town’s main market on the way to the port. A rumor spread that his cattle were infected with foot-and-mouth disease, which is infectious and sometimes fatal. This caused outrage at cattle camps around Mingkaman. A firefight ensued which caused panic among the town’s residents, especially the IDPs, fearing a backlash. Atem said Mingkaman FM covered the story, dispelling any rumor of foot-and-mouth disease spreading. He also took the next step of broadcasting messages of peace to the community to avoid revenge attacks, as armed cattle keepers are known to mete out vigilante justice. “We recorded five messages of peace in the Dinka language. We also aired local songs which contain peaceful messages to stop fighting among youth,” he said. The ongoing conflict in South Sudan started almost one year ago. It receives a lot of the media’s attention, while cattle theft and revenge attacks do not seem to raise the same kind of attention. Atem is trying to change all that. He believes community radio can help put an end to violence by giving it the attention it deserves, hoping to see it go from a local problem to a national issue. Mingkaman 100 FM is now working to include community leaders and organizations like Non-Violent Peace Force, a peacekeeping organization protecting unarmed civilians, to use radio in creating a peaceful dialogue in the community. Ayii said he has heard the messages broadcast by Mingkaman 100 FM and has now become a staunch advocate for peace among armed cattle keepers at the camp. “I have passed the message along to my brothers and sisters here. We don’t need to fight our neighbors and cause fear anymore,” he said. Internews’ work in South Sudan is supported by the United States Agency for International Development.